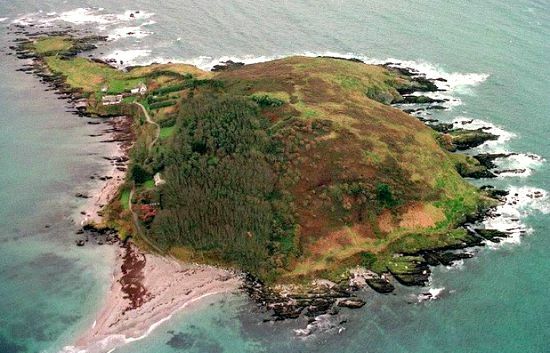 Looe Island has been inhabited since around 1000 BC, with stone anchors and various artefacts being found. It was thought to have been home to a huge tin trading post before the Romans arrived, and Joseph of Arimathea, who was Jesus Christ's uncle is thought to have brought the child Christ here on a trading trip, which made the island a place of Christian pilgrimage for the next few hundred years after Jesus died. The island had a small thatched roof chapel on it as the main site of pilgrimage during the dark ages, and this was rebuilt in the later medieval period when the island came into possession of Glastonbury abbey. Due to various ownerships of the island its name changed to suit who the owners wanted to dedicate it to, and from the 13th to the 16th centuries the island was known as St Michael's Island. After 1584 it became known as St George's Island. However the most popular stories about the island come from the 17th and 18th centuries when the island was a haven for pirates and smugglers. Cornwall in general had a real problem with the two and was the perfect place for sea criminals to go, due to its many hiding places on the shore line and it being positioned right in the middle of some major trade routes. The last people to live on the island was Babs and Evelyn Atkins who actually wrote two books about life on an island, but after Evelyn died in 1997, and Babs in 2006 the island was passed to the Cornish Wildlife Trust who own and care for it to this day. Day trips are available from the various Cornish tourist companies and it still houses the remains of the church set up as a pilgrimage site. You may think that the most probably ghosts on the island would be that of pirates or some spirits from its ancient past, however the most commonly encountered ghost here doesn't seem to fit in at all. There is a story from 1850 about the experience a dress maker had while visiting the island, which was well documented by local author Elizabeth Shapcott in 1928. The story goes that the couple living on the island at the time had made an appointment for a dress maker to come and stay overnight and perform some work for the couple. She arrived the day she was supposed to and was greeted by the couple, with the husband leaving for the mainland on business soon after she got there. That day the dress maker went to the top of the hill and began so sow with the pleasant view keeping her company. Everything went well until all of a sudden she got the feeling that someone was standing right behind her, and felt as if eyes were watching her intensely, though there was not supposed to be anyone on the island other than her and the couple with their young child. She retreated to the couples house where she continued her work and then went to bed as normal. Though during the night she suddenly woke, feeling as if something were incredibly wrong, but after staring through the room for a while nothing seemed to be out of place. But soon one of the walls started to produce a feint blue light, and then a tall man suddenly walked clean out of it and stood in the room, staring at her for a few seconds before walking across the room and walking straight into the opposite wall. The dress maker noted how the man had large hands with very long fingers, a feature which she couldn't get out of her head, and spent the rest of the night wide awake and staring through the room incase he returned. The next morning she was standing on the shore with all her things waiting for the husband to return with his boat to get her away from the place. This blue glow that's thought to accompany the man has been seen by many visitors to the island, with many people making claims of also witnessing the tall blue man with long fingers. This sounds just like any other ghost story at first but the especially strange thing about this one is that some time during the 1990's a skeleton was found near the peak of the hill which was of a man who had unusually long fingers, though there is no indication as to who he was or why he's there. As for other spirits, there are a few which have been mentioned over the years, but apart from the tall man the most commonly other seen apparition is that of a former pirate. Well, he is thought to be a pirate anyway which would explain his appearance, being described as a black man who is always seen with blood dripping down his face, believed to have been a former pirate or smuggler who was killed on the island during a dispute over their trade.